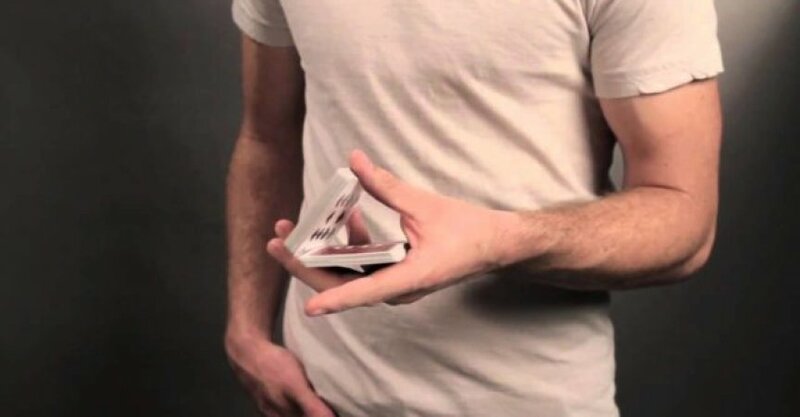 Home / Card Tricks / What is the One Handed Cut and how to do? What is the One Handed Cut and how to do? This one handed cut is the most vital section of card sleight of hand for all magicians. This move helps you to break the deck from middle by using your one hand. It is most important move and also it looks cool with some other advanced card tricks. To perform this move you need little practice not as much as with other moves of hand sleight. At the same time it really worth it, also you can use this move and incorporate with other tricks you have learned and for those you will learn in future. In case the move is not needed so at that time it helps you add extra flair in your existing trick. The first step to do this move, you need to get into the elevated mechanics grip that is given below. You need to put major pressure on the cards in order to concentrate on the pinky finger and index finger. However, remember that ring fingers and middle fingers should be there for support. Now in step two, you should split the cards right from the middle of the deck make sure you will use thumb for this. You need to push the top half of the deck by using your thumb in a way that it split into two portions. This will look exactly like this. To push off cards you need to release the pressure to your index finger, but also ensure most of the pressure should be towards your thumb to cut the deck in half. Now, get ready for the cut, when you push off the top half by using your thumb to slowly release the index finger entirely from the deck. Make sure the balance of the deck should be supported by the pinky cards. Slowly and slightly tilt the deck in the direction of pinky same like this. Now push the bottom half up by using the index finger till it hits your thumb. Now release the top half therefore it simply fall down. You can view the whole procedure in this picture, it should look like this, you can watch the preview from the side. This is the visual tutorial and video of complete move and how it looks like.